A $79 million mission struck a lunar bullseye early Friday and collected a wealth of data to guide scientists seeking water on the moon, but the impact was a dud for observers hoping to catch a glimpse of space fireworks. "We have the data we need to actually address the questions we set out to address, and that's the bottom line," said Tony Colaprete, the principal investigator for the Lunar Crater Observation and Sensing Satellite, or LCROSS. But after an ambitious campaign to engage the public in what was advertised as a visually observable event, the mission's Centaur rocket impactor crashed into the moon with barely a flicker of light at 1131 GMT (7:31 a.m. EDT) Friday. Colaprete said he was expecting surprises from the impact because it occurred in an unexplored corner of the moon littered with unknowns. "You just never know how these things are going to go," Colaprete said. 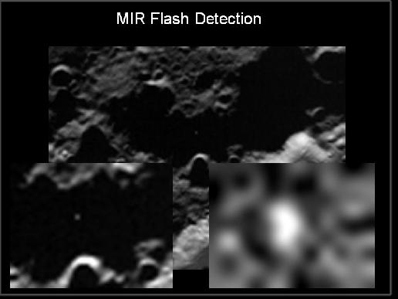 The LCROSS mothership, trailing the Centaur by less than 400 miles, detected a brief flash in thermal imagery at the time of impact. A few minutes later, LCROSS cameras captured a fleeting view of the small crater left behind by the high-speed collision. The mission ended at 1135 GMT (7:35 a.m. EDT) after four minutes of intense data collection as the LCROSS observing satellite plummeted to its own demise. "I was blown away by how long this little spacecraft lasted. It's going to be fun to see how close we were to the surface when we lost contact with the poor guy," Colaprete said. During a conference call with reporters before the encounter, Colaprete muted soaring expectations but said well-informed and well-equipped ground observers could likely see some visual evidence of the impact. It turns out no telescope, even the giant Keck and Gemini observatories in Hawaii, saw obvious signs of the impact in visual and infrared imagery. "Impacting into the moon is an unpredictable business at best," Colaprete said. 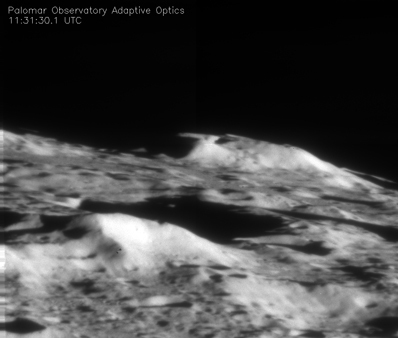 The Centaur hit the moon inside a 60-mile-wide crater, called Cabeus, believed to harbor elevated concentrations of hydrogen based on findings of previous and ongoing lunar missions. The lack of spectacular pictures of the impact may disappoint the public, but it does not deter from the main goal of the mission. "Our primary objective is what is that hydrogen? Honestly, the images don't answer that question. The spectroscopy answers that question," Colaprete said. Spectral data was the real driver behind the mission, and early results there are promising, officials said. "That, by itself, may constitute enough information to answer some fundamental questions," Colaprete said. Three spectrometers aboard LCROSS captured a breadth of information, but scientists are not sure if it is a direct measurement of an ejecta cloud, vapors, or surface material. The spectrometers are designed to detect the chemical signatures of minerals illuminated by light. Scientists are most interested in the spectral fingerprint of water or other hydrogen-bearing compounds. Scientists presented preliminary raw graphs of the spectral data during a press conference Friday morning, but warned it would take days before they knew what they were seeing. Spectral information from LCROSS is backed up by comprehensive measurements taken from ground observatories and the Hubble Space Telescope. Researchers are not ready to give up on the images yet, either. Although the video showed no easily-distinguishable cloud of dust, the science team will augment the video to get views with more clarity. "We need to go and carefully look at the images and see what's in them," Colaprete said. "Certainly, what's streamed out to the video is not at the same fidelity as what we get fresh off the spacecraft. It could be two months before Colaprete's team is ready to make a definitive announcement on what LCROSS found. "We have images, we have video, we have graphs with squiggly lines, which scientists love," said Jennifer Heldmann, coordinator of the LCROSS observation campaign. Although officials could not say with certainty if LCROSS actually detected a hard-to-see cloud of dust and vapor, some doubt was dispelled later Friday with news that the Lunar Reconnaissance Orbiter independently verified the existence of such a plume. LRO is circling the moon in a 31-mile-high orbit with a suite of more powerful instruments than LCROSS. The orbiter's LAMP ultraviolet spectrometer confirmed the detection of an ejecta plume shortly after the impact, according to Craig Tooley, LRO's project manager. The Diviner imaging radiometer also spotted the impact crater from LCROSS. Scientists now know some dust was excavated and kicked up by the impact, but questions remain regarding why the material was not as visible as expected. 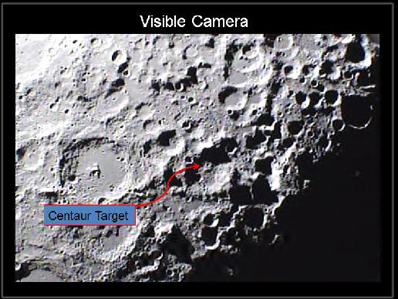 Colaprete said this could be due to an impact on sloping terrain or the Centaur striking a rocky area inside Cabeus, limiting the upward movement of lunar soil upheaved by the strike. Scientists maintain the sum total of the data is enough to fulfill the mission's lofty objectives. "You've been drinking from the fire hose. There is an enormous amount of data that we've gotten today, not just from LCROSS but from assets around the world," said Mike Wargo, chief lunar scientist at NASA Headquarters.